The rapid-filled Thompson River flowed from Kamloops Lake, behind the hill, to the Fraser River. This photography was taken near the Nicoamen River, I believe, and so shows the part of the Thompson River east of that place. 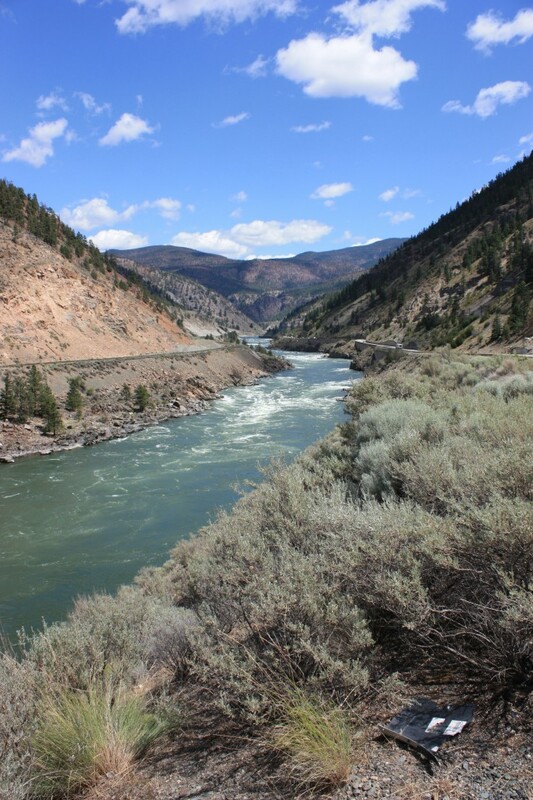 In our twenty-seventh post in this series, I will bring Governor George Simpson and his party down the North Thompson River to the post at Kamloops — and beyond! So let’s begin the story from their camping place at or near modern-day Little Fort, on the North Thompson River. Friday 3rd [October, 1826] — Our course in this river is south, and will be so, it is said, until we arrive at Kamloops. River pretty large, and no strong rapid. Saturday, 4th — Horses could not be collected early. Governor and three men in canoe again this morning; rest of us accompany the Horse Brigade. At Barrier[e] Village by eight. Crossed two rivers in succession soon after. Got to the Stockades about eleven, when the whole expedition again breakfasted, surrounded by the Indians of the Barrier, who are anxious to see the Governor, who made them a speech, and sealed it with a foot of tobacco to each, the Chief getting a more liberal supply. The road thus far to-day, is not bad, and to the House, is uncommonly fine. At the Pines we all took horse, and with our flag flying formed a respectable cavalcade. The Pines, or Les Pineux, is shown on all the maps of the area, and is about half way between the Grand Traverse and the Kamloops post, on the east bank of the North Thompson River. It is also mentioned in the journals of the outgoing expresses, 1826 and 1831 — so it was a well known spot. According to James Gibson’s Lifeline of the Oregon Country, the Stockades is south of Les Pineux, but of course in this journal it is not. Well, it appears it is not, but perhaps the author means that they took up the flags at Les Pineux, and rode south to the Stockades. Did not arrived at the House [Kamloops] before dusk. Pipes played, and much firing on both sides. Courtapolle [Court Apatte] and a few Indians at the House. Much to our satisfaction, we find our boat is finished, and which was begun only six days ago. Mr. [Francis] Ermatinger and four men here. Mr. [Thomas] Dears and six men at Fraser’s River for salmon. Sunday, 5th — The Governor expressing a desire to see Nicholas [Chief N’kwala], a man was sent for him. We await the return of the bearer till twelve o’clock. Mr. Ermatinger is to be continued here for the season. Mr. Dears arrived late from Fraser’s River, but the men will not be here for a couple of days. He says Mr. Yale and the canoes passed on in safety, the day before he got there, and that he did not see him. A good deal of salmon at the bridge. Indians about, anxious to see the Governor. From the west end of the second lake [in Marble Canyon], the party followed Le Pavillon [Pavilion River], a river named by the French Canadians for a British flag once conspicuously hoisted here. At its mouth, Le Pavillon flowed into the Fraser above a Native fishing village where Kamloops employees traded for salmon. Below the fishing village, the Fraser River poured into a steep-sided, rock bound trench that curved around the base of Fountain Ridge, a rounded hump of land that nosedived into the Fraser on its east bank and forced the river to bend to the west. A good deal of salmon at the bridge [Bridge River]. Indians about, anxious to see the Governor. Monday 6th — [Alexis] Laprade arrived about noon, but did not see Nicholas, he being out hunting. The Indians, immediately after, were directed to assemble in their own Hall [the Indian Hall in the fort], and there, the Governor, in due form, attended by all the Gentlemen present, met them. He, of course addressed them, and at some length, adverted to the propriety of behaving well among themselves, and exhorted them never to be guilty of theft, murder, or of an inhuman deed towards the Whites. To strengthen this argument he produced, read, and translated to them two letters sent by the Indian Boys at the Red River Settlement Missionary School to their parents at Spokan, and the Kootenais Country. These two boys would be Spokane Garry, and Kootenai Pelly, who had been taken to the Red River School to be educated and trained as missionaries, with the permission of their fathers. Kootenai Pelly did not survive his stay there, but Spokane Garry returned to the district in the same incoming Columbia express in which George Traill Allan travelled into the country in 1831. He became famous in this district, and was a powerful spokesman for his people all his life. The Shuswhaps [Secwepemc] listened to the contents with apparent interest, and of course promised to behave themselves accordingly. Lolew [Jean Baptiste Leolo] is engaged for three years as Interpreter: He and two “bouts” [boutes] accompany us from here. Boat in the water at four. Soon after, embarked in full puff, leaving Courtapolle [Court Apatte], Tranquille and the others small presents according to their rank and good behaviour. We are now sixteen in all. Blowing very fresh indeed, and only came to the entrance of the lake [seven miles below Fort]. Horses are sent from this place to meet us at the Coutamine from 20th to 25th, in case we do not go round by the Sound [Puget Sound]. For the same reason letters are sent to Fort Colville, Walla Walla and Vancouver. So you see that Governor Simpson intended to go down the Fraser River to Fort Langley, and then come upriver again, reaching Fort Vancouver by the regular route down the Columbia River! As you can guess, those plans were abandoned! But I am getting ahead of the story here. Tuesday, 7th — Having the Lake [Kamloops Lake] before us, we started this morning as early as four, and did not reach the other end [estimated at from 15 to 17 miles] before a quarter to eight, notwithstanding that it was a perfect calm, and that we had twelve paddles in the boat. At the breakfasting place, remained an hour and a half with Indians. Ran a number of minor rapids before we got to La Riviere Bonaparte by one p.m. A little below passed a dangerous one, then three dalles which were perfectly smooth, and below which was Rapide de la Grosse Roche, which ought to have been taken on the left side, as we took in much water by running close to the rock on the right hand. This we ran at quarter before two. In half-an-hour made Point Observation, or Wood Point, and in succession Rapide Croche, and Long Rapid at a quarter to four. To Coutamine [Nicola River] River Forks took us another half-an-hour. McDonald’s Encampment at quarter to five, and in fifteen minutes more, put ashore for the night. It is in this neighbourhood that the Indian suspected of killing two of our horses lives. We have a search for him. He disappeared, and we are as well pleased. His name is Babiard. Of course you are aware that Governor Simpson, James Murray Yale, Archibald McDonald, Jean Baptiste Leolo, and all the others, were now heading down the Fraser River toward Fort Langley, from the junction of the Thompson River. I will leave that to a later post, so that you can relax a little from their journey down the Thompson. In case you are interested in making this same journey, there are ways to do it — there is white water rafting down the Thompson River to the mouth of the Nicoamen. If you look at the photo above, I think you will see one of the rafts that carry brave tourists down this river!